Regardless of the career path a pilot chooses to pursue, one thing is certain: he or she must be well-trained. TransPac's structured, high quality course of study provides you with a solid foundation in all of the fundamentals of aviation needed to become a commercial pilot. As a result of our excellent airline pilot training, airlines around the world seek out our students not just as great aviators, but as well-trained professional pilots. Aircraft maker Boeing has forecast a need for 466, 650 more commercial pilots by 2029 — an average of 23, 300 new pilots a year. Nearly 40% of the openings will be to meet the soaring travel market in the Asia-Pacific region, Boeing predicts, but more than 97, 000 will be in North America (Source: USAToday, 6/21/2011). Our graduates land in one of the Top 50 Best Careers, as named by the US News and World Report in 2011. It's not the first time that the pilot career has landed on this type of list. To aviation professionals, it's really no surprise. Being a pilot is one of the most respected professions with many benefits and lots of exciting variety. To begin with, if you are the type of person that likes to travel to new places, what better way is there to explore the world? Pilots get paid to travel. Working for an airline enables you to travel inexpensively on your time off, enjoying the benefits of free flights and discounts on hotel rooms, rental cars and tour packages. Being a pilot is not a nine-to-five, Monday-through-Friday job. Pilots will have to work nights or weekends from time to time, but they get more time off than a person with a more traditional job. Senior pilots at major airlines can work as few as seven days a month, and junior pilots at regional airlines regularly receive schedules with blocks of three to five days off. Another appealing aspect of a pilot career is the challenge. Piloting an airplane requires a combination of technical knowledge, decision-making skills and hand eye coordination. Pilots find their job very satisfying because this unique requirement for both mental and physical skills provides variety in their work day. It doesn't hurt that every pilot's office has the best view in the company, and they never take their work home with them. An important element of any job is pay. Senior captains flying large airplanes such as the Boeing 747 or Airbus A380 can earn as much as $300, 000 a year. Not every pilot receives this kind of pay, but airline captains with ten years of experience make in the area of $150, 000 per year at major airlines and $80, 000 per year at regional airlines. Health insurance, life insurance and 401K benefits are typically offered as part of a pilot's compensation package. After earning a commercial pilot license, a new pilot will have between 200 and 300 hours of flight time. Generally this is not a sufficient level of experience to get hired as a corporate, charter or airline pilot. In order to build more flight time, many newly licensed commercial pilots obtain their flight instructor ratings, allowing them to provide inflight instruction to student pilots. A flight instructor working at a busy flight school can log 800 hours of flight time or more per year. Flight instructor pay at most flight schools is hourly. TransPac Aviation Academy offers flight instructors a salary which is one of the best in the industry, along with benefits and bonus pay opportunities. Corporate flight departments range from very small, with as few as two pilots and one aircraft, to large, with upwards of thirty pilots and ten aircraft. Corporate pilots enjoy getting the opportunity to know their fellow pilots. This is quite different from flying for an airline that may have several thousand pilots. Another attractive aspect of corporate flying is the variety of destinations. Business aircraft can fly to very small airports as well as major international hubs. As with airlines, pay is dependent on experience level and size of aircraft. A senior captain on a large aircraft can earn over $100, 000 per year. Schedules vary depending on the size of the flight department. In small flight departments, pilots are generally on call with few set scheduled work days, while large corporate flight departments are run more like an airline with pre-arranged schedules for each pilot. On average, corporate pilots fly from 200 to 350 hours per year. Charter companies can be any size—from a company with a single aircraft to a massive fractional ownership company that operates a fleet of several hundred aircraft and employs several thousand pilots. As with corporate flying, scheduling depends on the size of the company and ranges from being on call to having a set monthly schedule. Pay rates are similar to corporate flying. Generally, charter pilots get the opportunity to fly between 200 and 350 hours per year. Pilots that work for very large fractional ownership companies can fly as many as 800 hours per year. Pilots that wish to fly for the large carriers typically work for a regional airline first. At a regional airline, a pilot can accumulate 800 to 1000 hours of flight experience per year. The amount of time to be promoted to captain depends on many factors, but can be as small as two or three years. Captains at regional airlines gain valuable flight experience as the pilot-in-command of a multi-engine turbine powered aircraft. This type of experience makes them attractive candidates for pilot jobs at major airlines. Pay can be as high as $80, 000 to $100, 000 for a senior captain. This is lower than at the majors, where Senior captains can make upwards of $300, 000 per year. Receiving proper training is crucial to a pilot's success, regardless of the career path a pilot chooses to pursue. Every job interview will test a pilot's knowledge and flight skills because employers want to hire the most qualified pilot possible. Attending TransPac's structured, high quality airline pilot training ensures that you receive a solid foundation in all of the fundamentals that make up a well-rounded aviation education. 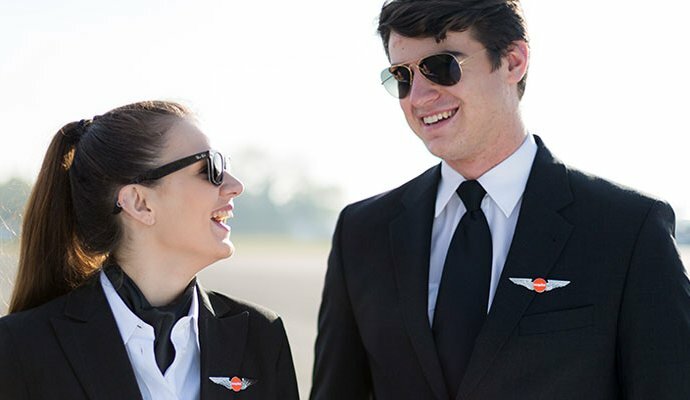 Our students are sought after by flight departments and airlines around the world because they know that our students aren't just great aviators, they have been trained to be professional pilots.